Is it a funny little boy or a 'terrorist'? (Newser) – A giant mural in downtown Boston featuring a figure in a head covering is triggering a debate sparked by some city dwellers who find it menacing. The figure, painted by Brazilian artist twins Otavio and Gustafo Pandolfo, wears colorful clothing, including a headwrap that also covers the mouth. 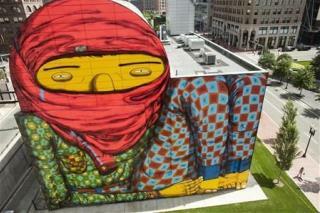 Residents complained to KOKH-TV that the 70-by-70-foot mural in Dewey Square looks like a terrorist, though the project's curator said it's a boy in pajamas with a shirt around his head. Some people think it could be ... both. "I don't care what it is supposed to be or who the artist is, it looks like a kid in his pajamas trying to look like an al-Qaeda operative," complained a commenter on the station's Facebook page. to be honest the only reason someone should cover their face is because they are very ugly. even bad face injuries are ok, but ugly people make everyone uncomfortable around them. now if you are ugly and your religion wants you to wear this, then you probably shouldnt leave the house beyond the sidewalk for everyone safety. Sorry, but a painting can't be a terrorist. Unless you lace the pigment with explosives and give it a 15 month timer. Seriously though, cool painting. It's obviously using scale to play with the idea of child. He's huge, he's afraid, he's superman, all in one. Seriously? This is like calling every white man a White supremacist and saying they are all part of the KKK . Complete Ignorance!!! !